We incorporated Sea Bags in 2006. My talk will largely be about decision making. I’ll start with the decision to leave a lucrative corporate career to do a start-up, and how we’ve come to 83 employees today. All decisions have been deliberate—some more thought out than others, and some with better results. My hope is that as consultants, this audience will gleam some insight into decisions small businesses face. Elizabeth Shissler, President & Chief Operating Officer of Sea Bags, LLC. was born and raised in Maine. Shissler left Maine for college and business school, and gained experience working for global companies. 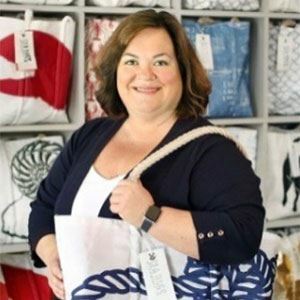 After extensive time with overseas companies she returned to Maine and bought into, incorporated and built Sea Bags, a privately owned company that designs and manufacturers tote bags and other products from recycled sails. Sea Bags products are now sold globally and are designed and manufactured in Portland, Maine. Currently Sea Bags employs nearly eighty people and owns nine retail stores with plans for four more in 2017. Sea Bags still operates on the founding principles on being green in product/practice, being made in Maine and acting as good stewards to our community and State. Beth also serves on the Boards for the Maine State Chamber of Commerce and the Gulf of Maine Research Institute. The ACE website is a trove of great information and tools for consultants. In this roundtable, Jim Casey and Judi Jones will present the new website and show you how you can get the most from it. We will walk through our Menus and explain how members can access all of the assets that will help your practice be more successful. We’ll let you know how you can optimize the use of the website in your marketing. Registrations (and registration cancellations) are required by March 14th, 2017. If you want to be included on the registration list at the meeting then you need to register by the due date.